She has settled in very quickly I think, loves to sit on the window sills. Likes to 'shoot out' from the cannon that in the bedroom (haven't found it yet) comes tearing down the stairs and then takes a flying leap onto the patio nets! lets go and then goes back up stairs at a rate of knots. The other night at silly o'clock I was woken to the sound of plastic, she had stolen the DREAMEES bag from the kitchen I'm sure she got it out of the cupboard) and was doing her best to open it in the back bedroom, I'm so glad I sealed it. She really is a very affectionate cat and I'm so glad we were able to give her a home." 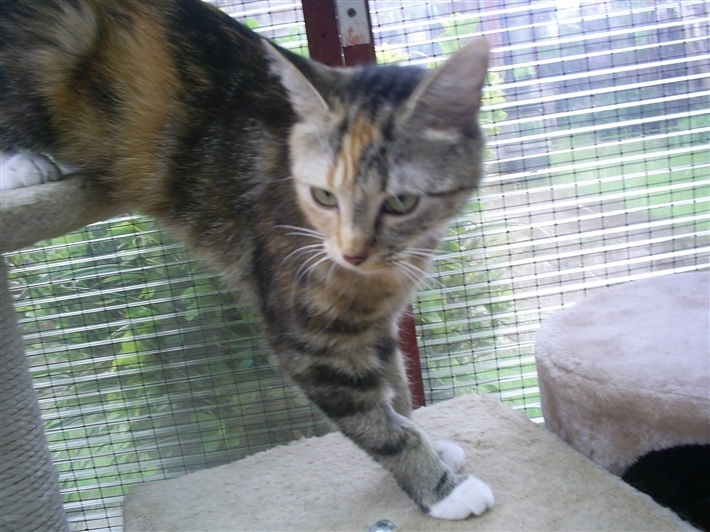 photo shows Roobarb when she was in care. C'mon on Carole, we'd love to see a picture of the lovely Roobarb at home, or perhaps she's too quick to catch on camera!